stuffed with oreos. topped with cream cheese icing. and sprinkles. these brownies are heaven. pure heaven. just look how fudgy! 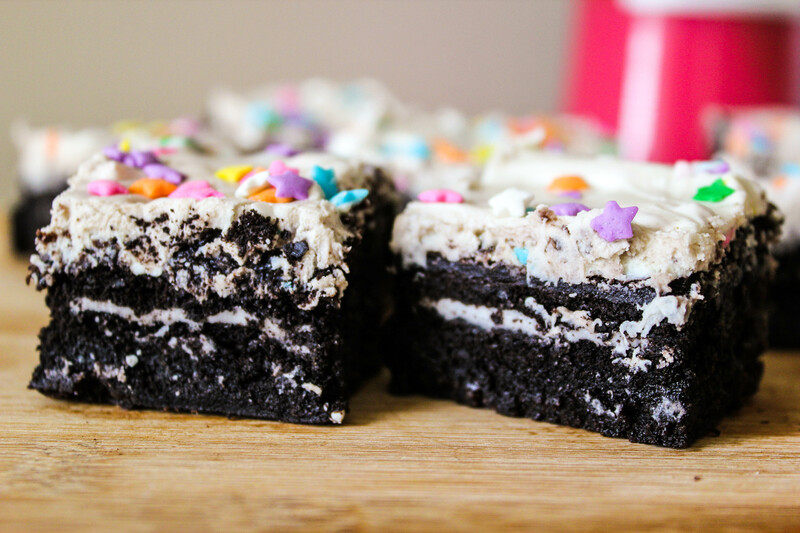 i’ve been wanting to make cookies n cream brownies ever since i made my super soft (and easy!!) cookies n cream cookies. mmmmm. while i have my go-to brownie recipe made from scratch (see bottom of my post here for my super fudgy brownie recipe), i actually used a BOX mix (the horror!) for these brownies. 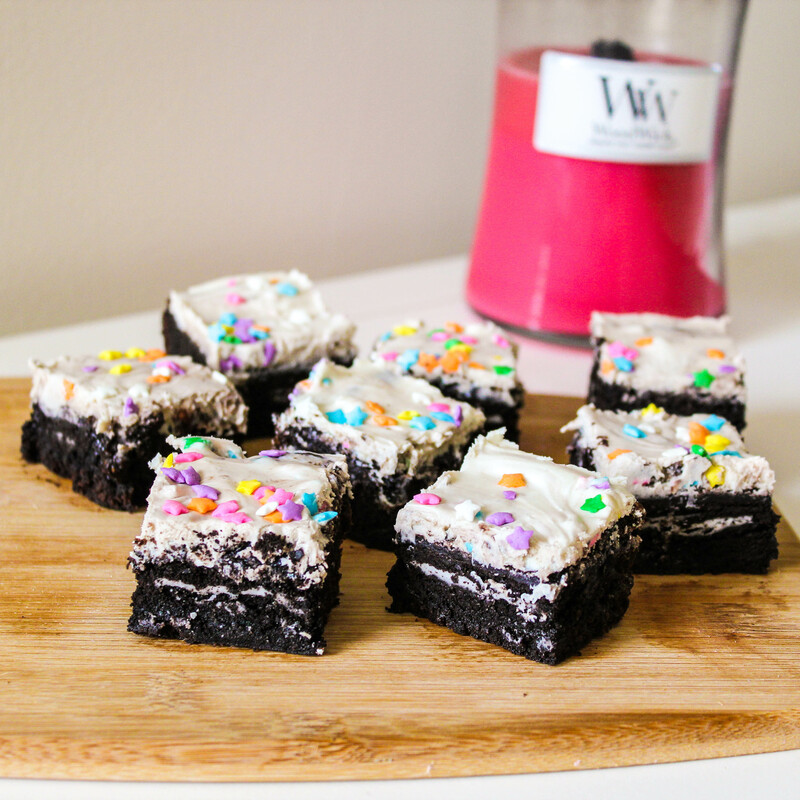 i trusted my blogging pal Lindsay @ Pinch of Yum when she said this boxed brownie mix makes the best brownies she’s ever had. you can certainly use your favorite brownie recipe, but i was in a rush and wanted to save on time. i love baking shortcuts where i can find them! this recipe is fool-proof. mix up your brownies according to the package instructions. pour 1/2 of the batter into a 9×13 inch baking pan. line whole oreos on top of bottom batter layer. pour the rest of the batter on top of the oreos. bake according to package instructions. 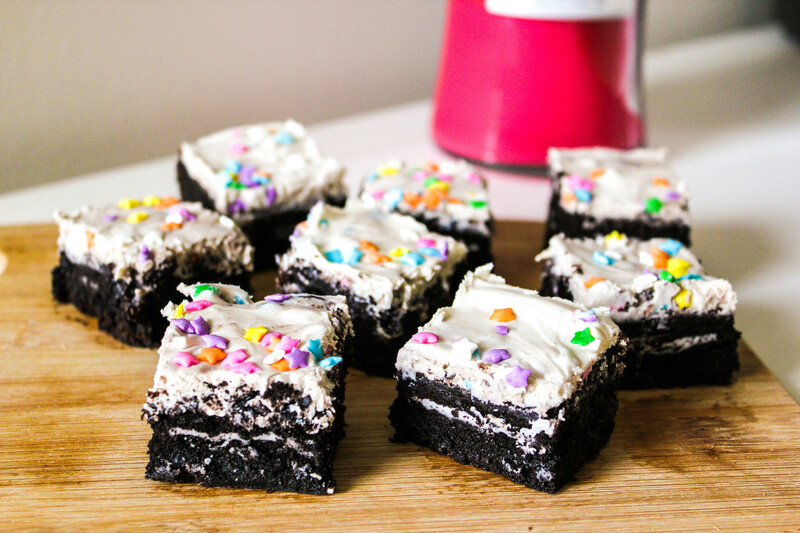 Averie’s oreo cookie stuffed brownies with vanilla buttercream frosting inspired me to top these cookies n cream brownies with icing & sprinkles. i used store bought cream cheese icing. again, who doesn’t love shortcuts?! my favorite part about these brownies? the oreo cookie melts and creates an unbelievably gooey, fudgy brownie encasing the sweet oreo cream centers. i die. Preheat the oven to 325F. Spray 9×13 inch baking pan with nonstick spray. Set aside. In a large mixing bowl, prepare the brownie mix as directed with the egg, oil and water. Pour 1/2 of the brownie batter into the prepared baking dish. Line Oreos in rows (3 down and 5 across). Pour the rest of the brownie batter over the Oreos. Allow to cool completely and frost with cream cheese icing. Top with sprinkles and stick in the refrigerator so the frosting sets. Once the frosting is set (about 1 hour), cut into squares. Enjoy! ps: you may also enjoy these chocolate-y treats too! yum yum yum! I love Oreo! I also made this week Oreo brownie and cupcakes.. But I have to give this a try! OMG Sally your recepies rock my world ! 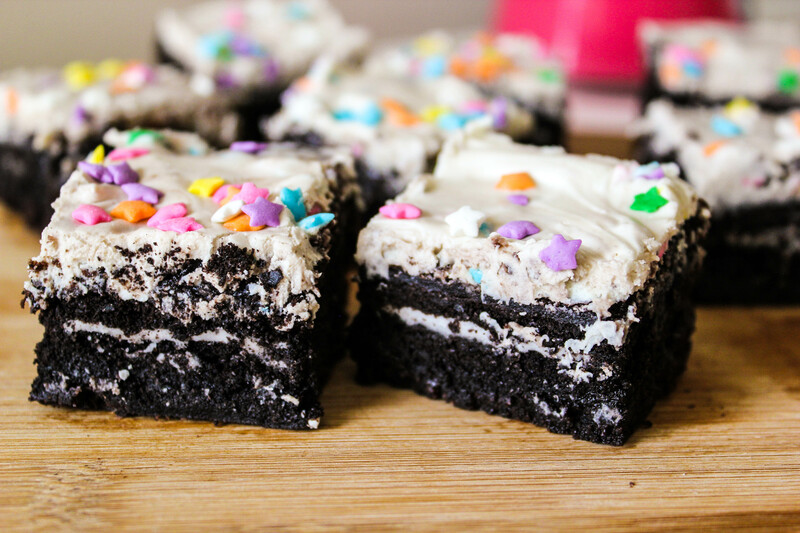 I love a good oreo stuffed brownie:-) And one with cream cheese frosting and sprinkles totally makes my day!!! These look awesome!!!! All of these delicious recipes, have me wishing we were neighbours 😉 lol these all look soooo yummy!! yumyum. do the oreo cookies get soft when you bake them or do they stay hard? definitly gonna make them too! Those brownies are clearly to-die-for. They look so nice! you’ll soon be transferring your baking addiction over to me! Wow, I love that you took Lindsay’s brownies to a whole other level! Well done! oh yum, I am all for box mix when you need it! Holy moly! These brownies look outrageous (in a really good way)! Wish I had one right now!! Love the idea of oreos combined with a brownie! Okay seriously I might have to take peeks at your blog more sparingly because I want to bake EVERYTHING! The stuffed oreo brownies and the chocolate dipped ones? Oh my!!! (Well, really oh my to everything.) It all looks so delicious, and the photos are always pretty too! YUM! These look and sound amazing! Hey Sally, i’m planning on trying that recipe for my friend’s bday tomorrow, just a question though, when you say “prepare the brownie mix as directed with the egg, oil and water.” If i’m not using a mix, do I still have to add the egg, oil and water? It’s just that i’m trying to figure out what all those cups and ounce are in grams and ml..;and i’m a bit confused 😉 thanks ! Hi Mo! Sorry for the confusion. Prepare the brownies according to the boxed mix instructions. The mix I used, ghiradelli double chocolate brownie mix, calls for an egg, 1/3 cup oil and 1/4 cup water. However, if you are making brownies from scratch, use the ingredients your recipe calls for- do not add in the extra egg, oil, or water I listed in my ingredient list. Hope this makes sense! yeah that’s what i thought but just wanted to be sure !! thank you SO much 😉 Hope it’ll look as yummy as yours !